You’ve found a tremendous network – great for exchanging knowledge between writers, illustrators, editors, publishers, and other adults who treasure creating literature for young people. The Southern Breeze Region, our professional home, is one of more than 70 International SCBWI Regions, and we have more than 100 published authors and illustrators. 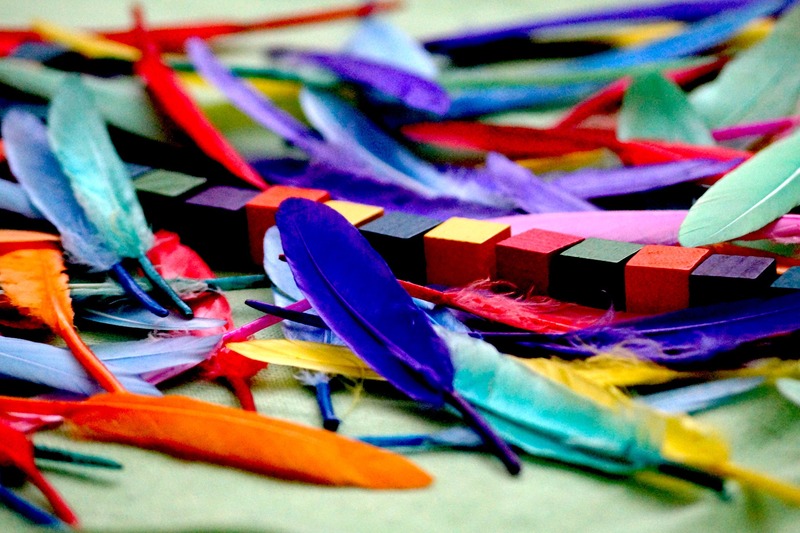 Our organization has nurtured fun rainy-day tales, thrilling adventures, and classic children’s literature. As our members unveil each story of success the excitement spreads like kudzu! We hope you and the children in your life enjoy getting to know us and our stories. Our regional newsletter, Southern Breeze News (SBN), contains exclusive market tips, publishing news, business and craft tips, success stories, event information, and more. Here’s how to send us your good news and helpful tips. The latest Southern Breeze News (SBN) can now be found online! Southern Breeze members will also find future issues in their “in box”, rather than their “mail box”. We will be very happy if you want to support our activity by simply donate. Here is the moment where we want to give our special thanks to the first who believed in us – an online casino directory, where there are listed the most popular live casinos online. That’s right, we’re going electronic! Oh, yes–we’ll still mail reminders of upcoming conferences and registration forms. The SBN has been a semi-annual, hard copy, publication for many years. A few past issues can now be viewed online as well. Vicky Alvear Shecter, Author It’s hard enough to sell a project, but when a publisher cancels a book, it’s just heartbreaking. That’s what happened to my second book. One day, I got a nice letter saying they wouldn’t be publishing my manuscript after all. They were closing their doors. And oh, by the way, they wanted their advance back. I was devastated. But after I picked myself up off the pity-potty, I began submitting the book again. I submitted to Boyds Mills Press, flagging myself as an attendee of a Southern Breeze conference where the editor—Larry Rosler—had spoken almost a year before. (Okay, I admit, I pretended not to notice that the six-month window for such submissions had been closed for a while. Still, I wasn’t lying—I had attended. Plus, I figured the worst that could happen was that the manuscript would go to the bottom of the slush pile anyway.) Weeks later, I got a phone call from Larry. He was interested. Would I send him more? Within a couple of months of submitting to him, I had a contract. I had resold the book. CLEOPATRA RULES! THE AMAZING LIFE OF THE ORIGINAL TEEN QUEEN came out this past August. There’s more. In my frenzy of re-submissions, I had sent a query to Cheryl Klein at Arthur A. Levine Books/Scholastic (don’t ask me why since they’re not known for publishing nonfiction). 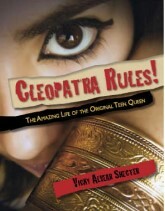 Well into production with Boyds Mills, Cheryl Klein asked to see more of CLEOPATRA RULES! I had, of course, to breathe into a paper bag before I could tell her that it had already been sold. But then I asked if she might she be interested in the YA historical fiction novel I was working on. She liked the pitch. To make a long story short, Cheryl Klein eventually purchased my novel after it went to auction. So, in a roundabout, circuitous way, Southern Breeze was responsible for the sale of my first novel too! Moral of the story: Go to conferences; submit, submit, submit; and never give up. 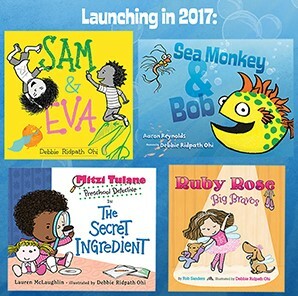 Articles and artwork for interest for the SBN are always welcome for consideration from current SCBWI members. E-mail your scanned black and white or color illustrations to Heather Montgomery. Articles about illustration are needed as well. SBN appreciates One-Time-Rights for articles and illustrations we publish. After we have accepted / published the work you’ve submitted, you may pursue other avenues for publishing the article or art. It is against SCBWI policy to review ANY children’s books in regional newsletters. Acceptable reviews include How-to books on writing and illustrating, and books of essays about children’s literature. Send approved local schmoozes or other SCBWI events to Heather Montgomery. Submission format: Date, time, Program Title, location, description, contact name and e-mail address. 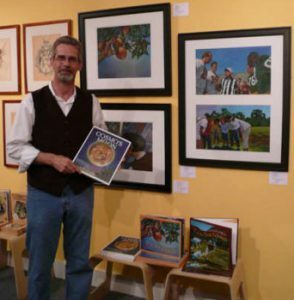 After two years and a number of stops at various venues in he south, the 1st Annual SCBWI Southern Breeze Children’s Book Illustrator’s Gallery Show which ransformed into the traveling gallery show Storybook Look: Illustrations by Southern Artists” recently came to a close. There were 28 pieces of original art from children’s books created by 10 of the Southern Breeze’s more notable artists: Rick Anderson, Ami Blackford, Mark Braught, Karen Stormer Brooks, Sarah C. Campbell, Liz Conrad, Elizabeth O. Dulemba, Laura Knorr, Daniel Powers, and Rick Spears. It‘s always a treat to see the riginal art for any one project, let alone the work of so many at one time, in one place. The show was well received with generous publicity and reviews at its appointed stops including: the Saenger Theater in Hattiesburg, Mississippi; the Art Institute of Atlanta, Decatur campus during the Decatur Book Festival; the Live Oak Public Library during the Savannah Children’s Book Festival; the Discovery useum of Western Tennessee in Jackson; the Georgia Children’s Museum in Macon; and, the Golden Isles Arts and Humanities Association in Brunswick. A HUGE “thank you” to the number of hosts that presented the show–the SCBWI, Southern Breeze, South Arts, the National Endowment for the Arts, and the many volunteers that make any project like this possible. And most importantly, thanks to everyone who visited the various locations to view the art. Without these people, nothing of what we do would be possible. There is always a little sadness when a show comes to a close, followed by the anticipation of what could follow. By now, all the work is back at home with their respective creators and they are busy at work with their latest projects that will be in your local bookstores soon.